Have you ever seen a problem and wanted to do something about it? Of course you have. The schools, police, government welfare offices, churches and families aren’t handling it. Others share your concerns and want to do something. That’s why you would start a nongovernmental organization, or NGO. This handbook will guide you through the steps of starting and operating an NGO. The online version includes several translations such as Arabic, Chinese, French, Persian, Portuguese, Russian, and Spanish. To the extent possible under law, Hilary Binder-Aviles has waived all copyright and related or neighboring rights to The NGO Handbook, except where otherwise noted. Yes, the NGO handbook provides the reader with a number of chapters that all-together make up a comprehensive overview for envisioning, starting, and maintaining an NGO. There is an index at the beginning with pictures to detail the chapters, however, there is not a glossary or index at the end of the text as you would come across in most textbooks. But, then again, this is not necessarily a textbook, more of a step-by-step guide. I did not come across anything that made me question the content. It was generalized information, and did not go into detail about the "good" or "bad" role NGOs play necessarily, but, kept a focus on how you can start one effectively. The handbook is general enough for the content to stay relevant for a lengthly amount of time. It is all up-to-date information and the text is written and/or arranged in a way that updates would be easy to implement. A simple addition of a side box, or elimination of a picture could easily make room for an additional point. The language is written in a simplified manner, and I believe that it could be read easily by almost anyone wanting to obtain information about starting an NGO. I did not come across any jargon or technical terminology; however, I think adding some of the common language used in the "world of NGOs" could be placed in sidebars to get readers familiar with some terms or ideas they may come across in their NGO work. Yes, I found each chapter formatted very much like the last, and it keeps its consistency with terminology throughout the text. The text was so consistent, it almost felt repetitive at times. Yes, you can easily divide the sections into smaller assigned readings, however, its also relatively short and easy to read; thus, I wouldn't recommend only assigning 1-2 chapters with no supplementary material for homework. Also, if the class is just wanting to learn about NGOs, many of these chapters could easily be omitted as they are geared toward more practical application (i.e. how to obtain grant money). Yes, the topics in this text are presented in a logical, clear fashion. The text starts with more abstract topics, like NGO visions, and then starts to break down the different practical steps and areas in which an NGO should focus as they move forth. I found no interface issues. The pictures were all very clear and were a nice addition to the text, drawing the reader in. Also, I found the colouring and graphic design work helped as the neutral colours complemented the text well. I could not find any grammatical errors, which I consciously looked for. The text makes an attempt to include a variety of races, ethnicities and backgrounds in both the examples they use of NGOs (both real and not real). For example, one NGO they mention is Young Women United in Albuquerque, New Mexico, which is an organization that supports coloured women. Moreover, they use a variety of pictures depicting people from all over the world, such as the Nepalese women pictured near the end of the text. This is a great handbook - however, I am finding it hard to imagine a course in which this would be appropriate, or actually useful for a class. Unless it is a more hands-on class dedicated to starting NGOs, or the students are tasked with a similar assignment, this guide doesn't seem fitting. I also think the handbook could go a step further with the bibliography at the end of the text, which lists relevant websites and sources to consult. In-text links would be even more helpful, which could direct readers to the website of example NGOs, blank downloadable worksheets, etc. that could be specifically mentioned in the text, or side boxes. Since it is a more practical handbook, at least an accompanying website with more sources would be handy for those starting an NGO. 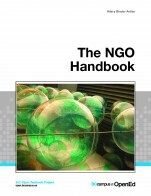 NGO Handbook offers an overview suitable to its purposes. Despite being understandably USA-centric (published by the Bureau of International Information Programs, United States Department of State), it sets out a range of issues that are broadly relevant for starting and sustaining an NGO. There is no index or glossary as such, but inset boxes are used throughout to highlight key terms and concepts. Accepting the broad, guiding assumption that NGOs and governments play mutually supportive roles, the content is accurate and unbiased. Some NGO start-ups, in contexts where government–NGO relationships are more confrontational than cooperative, may find this assumption a ‘bias’ that qualifies the accuracy or relevance of certain Handbook sections. The dynamics of multiple government levels (e.g. 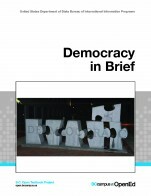 local, provincial/state, federal) might also invite more discussion and clarification of the interactions between two types of NGO–government relationship that are identified: “to hold governments accountable” (p. 62) and “cooperate with governments” (p. 63). Further, the absence of any discussion of conflict within the intervention processes is a significant omission. The Handbook discusses the conflicts into which NGOs might intervene, as well as board governance conflict of interest issues, but fails to mention the potential for conflict to be catalyzed as an unintended consequence of NGOs interventions. Sufficiently general to retain its relevance over time, the Handbook’s modular layout is well suited for any necessary updates, such as when the NGOs or projects mentioned are completed, or the web-based resources are no longer current. E.g., at the time of writing this review, http://www.mosaica.org/ (the lead author’s former role/employer) does not link to the organization mentioned, but instead to a URL that appears to be for sale. Also, http://www.nonprofitexpert.com/world%20ngos.htm is a deadlink (404 Error); rather http://www.nonprofitexpert.com/world-ngo-resource-page/ . The Handbook’s clear and simple prose is highly accessible. The relative lack of ‘third sector’ jargon and acronyms is laudable. Nevertheless, it might be helpful to include some of the most common sector ‘buzzwords,’ perhaps in a glossary of terms as an appendix, collecting together also some of the “What’s This” inset boxes. 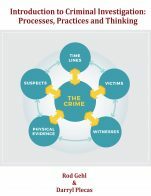 Fitting to its purposes as a guide, the Handbook’s consistent diction and structure make it potentially useful also as a teaching and training tool. E.g. the use of boxes (What’s this, Try This, Remember, etc. ), bullets, and subheadings (especially Conclusions) reinforces the Handbook’s consistency and clarity. The Handbook’s modular layout is well-suited to being updated or supplemented, as well as aligned to specific teaching or training needs. Indeed, at under 80 pages, and with no chapter exceeding 15 pages (~2,500 words), the content may be easily parsed out in shorter readings, and assimilated in a short amount of time. By following the arc of NGO start-up from purpose and vision to management and sustainability, the Handbook reinforces its consistency and clarity; it moves from the more abstract to the more applied aspects. Moreover, the flexible modularity allows for this arc (less-to-more concrete) to be adjusted for specific teaching or training needs. Overall visually appealing and accessible, one image (p. 25 “Somali organizers discuss strategy at a training session offered by Mosaica.”) appears slightly pixelated at 100% magnification. Free of errors, the text is highly readable, at an approximately 8–9th-grade USA reading level (assessed with combined online readability measures). 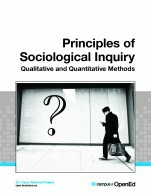 With its examples, both actual and hypothetical, the Handbook includes an identity range appropriate to the NGO sector in the USA context, as well as internationally. Discussions of diversity focus on funding, board members, talent, and stakeholders. 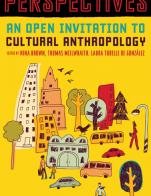 There is little discussion, however, about relevance of cross-cultural settings for NGO interventions and activities. More sources in the bibliography could refer particularly to Canadian (federal and provincial, and local) organizations; e.g. The Canadian Council for International Co-operation (CCIC) its provincial chapters, and its member organizations (www.ccic.ca). As a practice-oriented document, the Handbook would be further enhanced with more explicit mention of designated online support materials to enrich teaching and training. Given the readability, modularity, generalness, and practical orientation, the Handbook would find a place in early-years undergraduate (First Year, Second Year), or even senior high school (grade 11–12). Courses that discuss ‘development actors’ at local and international levels (e.g. World Issues, Global Studies, International Development, and Conflict Resolution) could use this to launch assignments centred on imagining a hypothetical NGO. As a US government-sponsored document about an NGO as “a powerful way to bring about change,” the Handbook could also be analyzed critically by more senior undergraduates. Deconstructing development discourse is an important part of university-level study of the practices that the Handbook intends to promote and facilitate. As the ‘raw material’ for critical analysis, the Handbook is a rich source of examples of many common assumptions about development issues, processes, actors, and relationships.